Establishing trust between you and your readership is critical to your blogging success. Without trust, there is very little chance of your blog ever making it big. When your readers trust you, they will recommend you to their friends and they will be more incline to buy a product or service recommended by you. Here are seven ways to gain the trust of your readers. Building trust is all about building relationship and the relationship on the blog starts at the About page. The amazing thing is, most bloggers don’t bother with that page. I’ve read countless blogs where the about page is still in the “This is an example of an about page” default. My About page is my second most viewed page after the main page. Your readers want to know who you are so if your About page is blank, fill it up! I would recommend going beyond the About page with a personal post about your life every now and then. I read many other blogs that are in my niche and the ones that I always come back to are the ones that reveals more about its author. If all you do is stick to your topic and never deviate from it, you’re going to have a hard time separating yourself from the millions of other blogs talking about the same topics. Many blog readers relate to the writer more than the topic so let your personal style come out by telling how the topic affects you. At the very least you should have a contact page where your readers can email you. The more ways for readers to get in touch with you, the better and faster you can build that relationship. You should look beyond simple email and start taking advantages of social services like Facebook, LinkedIn, Twitter, YouTube, etc. Generally, the more contact points the better but don’t go overboard. Having too many contact points will just confuse the readers. Readers can relate to you more if they can connect a face to a name. Your About page should have at least a photo of yourself. This shows your readers that you’re not trying to hide behind some computer screen. It also makes you more trust worthy. If you want to go beyond that and really get personal, upload some videos of you and your daughter on vacation at Disneyland or show them what you’re having for lunch. One of the best trust building video I’ve made was call The Dot Com Lifestyle. It’s why I have it on my blog front page. The video instantly create an emotional response with the readers. They see who I am and what I’m really about. Originally, I was going to put that video in my About page but decided to add it to the front page since it is the most viewed page. My email system is one of the best trust building tools in my arsenal. When a new reader subscribes to my newsletter he is sent a series of emails that are designed to form a relationship by building trust. These emails are sent out automatically using the auto responder feature of Aweber. You have a lot more control over the relationship building process with email than you do with a blog. The content on the blog is always changing and it can be hard to control the message. This is not a problem with email since you can tailor the message exactly the way you want and tweak it until it’s perfect. In my post on How To Make 2011 Your Best Blogging Year, I said you need to start your mailing NOW. I can not overstate how important this is. I will go as far as to say that you will not find a single big money making blogger who does not have a mailing list. The mailing list is the foundation of your blog. If you still don’t have an email list, head over the Aweber right now and sign up for an account. It only cost $1 for the first month and it’s back by a 30 day refund policy. They’ll give you the $1 back if you’re not happy. Offering readers multiple contact point is nice but it’s worthless if you don’t engage them when they contact you. If a reader leaves a comment on your blog, then you should answer them. This is especially true if the comment is a question. The blog comment system is the best communication tool between the blogger and his readership. You should do everything possible to encourage blog comments. The same holds true for Twitter, Facebook and other social media outlets. These tools are more than just a channel to spread your news. They’re also great to engage and get feedback from your readers. By far the most effective way to build trust with your readers is by face to face networking. Nothing build a connection more than being able to shake hands with your readers. This is why I attend so many trade shows and networking events. I have built many life-long friendships by attending events like Affiliate Summit, Blog World Expo, Ad Tech and many other events. You don’t have to start with a major event like this Saturday’s Affiliate Summit. Start with local events and work your way up. Use Meetup.com or another service to find others who are blogging about the same stuff you’re blogging about. I’m sure you’ll find tons of event in your own backyard. I threw up this last tip more in fun than anything else. 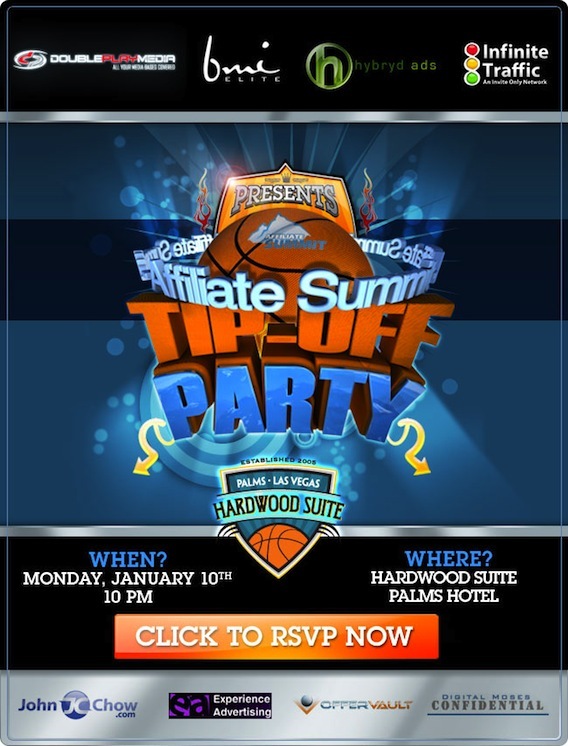 Throwing a blow out party, like the Affiliate Summit Tip-Off Party, can run as high as $100,000 and it’s really more of a brand building exercise than a trust building one. However, a big part of branding is building trust. If you can elevate your brand, it will make you more trustworthy. However, I do recommend your blog to be well established and making a ton of money before blowing $100K on a party.